SPORTS fixtures and other events were cancelled due to snow in Henley and South Oxfordshire at the weekend. Matches on Saturday were not affected despite persistent but light snowfall. But heavy snow during the night meant many events on Sunday were cancelled. 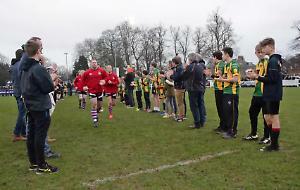 Henley Hawks were due to face Taunton Titans at Dry Leas at 2pm but the match was called off. The fixture was due to take place two weeks ago but was cancelled due to snow. The club said it would rearrange the fixture once again and apologised for any inconvenience. Henley Hawks women’s game against Bath Ladies was called off as well as all mini and junior rugby scheduled at Dry Leas. Sunday’s football match between Henley Town and SC United at the Triangle Ground was postponed. Community litter-picks in Bix and the Assendons and in Rotherfield Greys were called off. Some roads and pavements were still icy on Monday but this had melted by the afternoon when temperatures reached 4C.